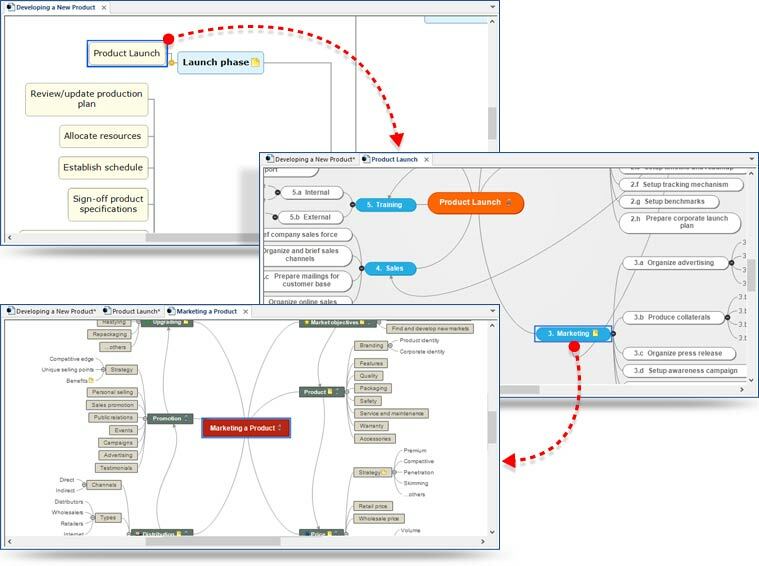 All versions of MindView include different views, powerful mind mapping features and award winning MS Office integration. Whether you're a beginner, an experienced mind mapper or a project manager, there is a MindView solution to meet your needs. MatchWare MindView's brainstorming mode is an invaluable tool for capturing the bursts of inspiration that emerge during group planning meetings. This powerful, yet easy-to-use program lets you instantly capture those ideas without disrupting the brainstorming process to define their precise wording or positioning. Once all the ideas are collected, simply click and drag the branches and sub-branches to move them to the appropriate position. Focus on a particular set of branches by applying a filter or temporarily collapsing other branches and add comments, pictures and formatted text notes at any time to illustrate or expand on specific points. Finally, MindView lets you highlight conceptual relationships between two or more branches by creating visual connections between them. MatchWare MindView's Multimedia Catalog contains 1500 high quality clipart illustrations created specifically for business and education use, as well as numerous root shapes and map styles. Simply use the keyword-based search tool to find the elements you need and drop them onto your workspace. You can also use the catalog to store and view your own elements. 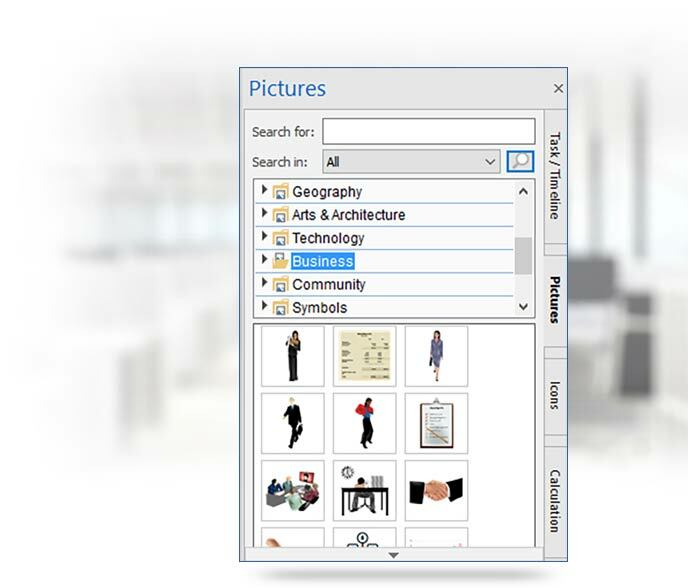 In addition to the Multimedia Catalog, MindView contains a palette of icons, which you can place on the branches of your Mind Map to draw attention or illustrate a particular idea. MindView allows you to add numeric values to the branches of your Mind Map, for example sales numbers, costs, exchange rates and so on, and also formulas to carry out calculations on the values. Built-in functions allow you to display values automatically rolled up from lower sub-branches to higher ones. If for instance you want to create a Mind Map to consolidate the sales figures coming from different geographical regions, you can use the built in function SUM to add up values entered on the outermost sub-branches (the regions), providing a grand total on the root and sub-totals on intermediate branches. To enter values, you use the Calculation panel, conveniently accessed from a tab on the right of the workspace. Values appear on the Mind Map under the branch labels. For any branch, you can choose to display or hide the values as you wish. The data can then be exported to an Excel spreadsheet with the simple click of a mouse. Choose from a variety of professional map styles to apply different branch shapes, branch colors and other coordinated attributes to your map in one easy step. In addition to text notes, MindView lets you attach any number of external resources to the branches of your map, including documents, pictures, videos, sounds, hyperlinks, Flash® animations and more. Hyperlinks can be used to connect to websites, folders, or files such as Excel or PDF documents. All these attached resources are easily viewed by simply clicking their names in the object list associated with the branch. Use the Pack & Go feature to save your Mind Map with all its attachments and share it with other users. MatchWare MindView includes over 80 business and educational templates, supported by over one thousand high quality clipart images. Once you have created your Mind Map using one of these templates, you can easily tailor it to meet your specific needs. Ideas and suggestions for expansion are provided in various notes and pop-up comments. 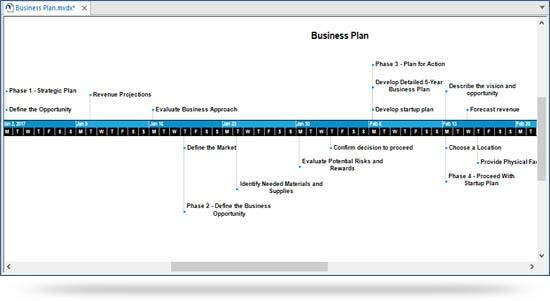 To help you get started, MatchWare MindView also includes many ready-made project plans for common business activities, such as organizing a trade show, producing a publication, launching a product, etc. for use in the Gantt view. 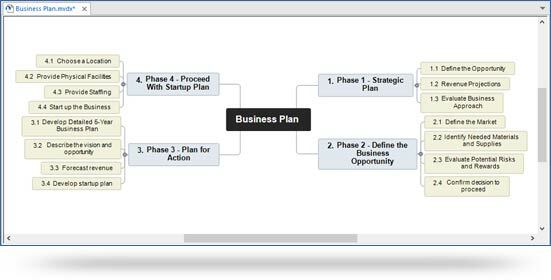 You can use these ready-made plans for training purposes or as a basis for your own project plans. MindView lets you link several documents by creating connections between relevant branches. Clicking the branch connection from the source document automatically opens the linked map in the target document. You can also detach a branch to create a second Mind Map in the same workspace or in a new document. Print your maps 'fit to page' or spread them horizontally and/or vertically over multiple pages for a better overview or to display as a poster. This feature is particularly useful for timelines and Gantt schedules. MindView lets you develop your Mind Map in 6 different views depending on the nature of your data. You can easily switch back and forth between views at any time while creating your map. The Mind Map view represents the map with the root in the center and the main branches radiating from it in a clockwise direction. This view works especially well in the brainstorming mode, when you want to collect ideas related to your theme without worrying about analyzing or organizing them at that stage. This shows your map as a hierarchical pyramid, with the root at the top, the main branches underneath, the sub-branches below the main branches, and so on. Use it to represent structured data that needs to be viewed in a hierarchical manner, i.e. from the highest to the lowest levels. This view represents your map as a sequential list of topics placed either on the right or left of the root (Right view or Left view). This view is a good option when you need to present structured data in list form (e.g. a list of steps) and want to fully explore each point in the list before moving to the next point. Use this view to represent your map as a linear hierarchical list, which you can expand and collapse as required. The Outline view allows easy navigation through the document from top to bottom and provides another tool for brainstorming. It is also a convenient method of entering and viewing task information related to the branches of your map (see Task Management below). Use the Timeline view to display events such as company history, execution of marketing strategies, project plans and historical data. Simply insert dates or times on your branches and switch to the Timeline view to see your information displayed along a horizontal time axis. The different timescales available (standard, daily, weekly, historic and geological) let you represent a variety of time-related events. Zoom in or out, expand or contract the timeline scale, or condense empty stretches of the timeline by inserting break marks. You can then export your timeline as an interactive HTML site, include it in a visual presentation, or print it out as a poster! 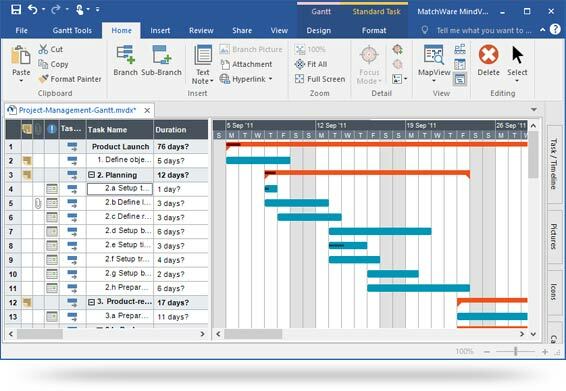 The MatchWare MindView Gantt view is a specialized view dedicated to the creation, editing and management of project plans according to the rules of project management. 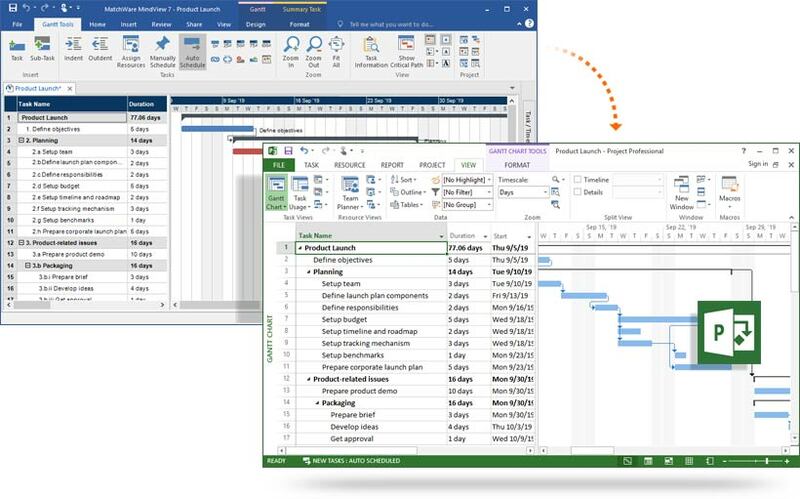 The view has two parts: an Outline on the left, representing the project as a hierarchical list of tasks, and a fully dynamic Gantt chart on the right, showing the tasks as horizontal bars arranged against a calendar display background. MindView also lets you export your project plans to Microsoft® Project for further development or import existing Microsoft Project plans into the Gantt view directly from Microsoft Project or via the Microsoft Project XML format. As mentioned above, MindView lets you export your task lists to the task folder of your choice in Microsoft Outlook. 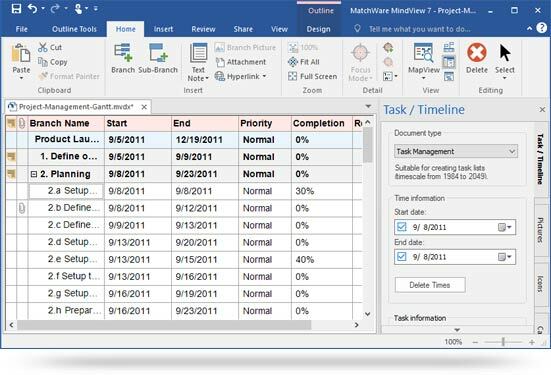 You can also import task lists from Microsoft Outlook and use MindView to synchronize the two versions of your task list stored in Outlook and in MindView. 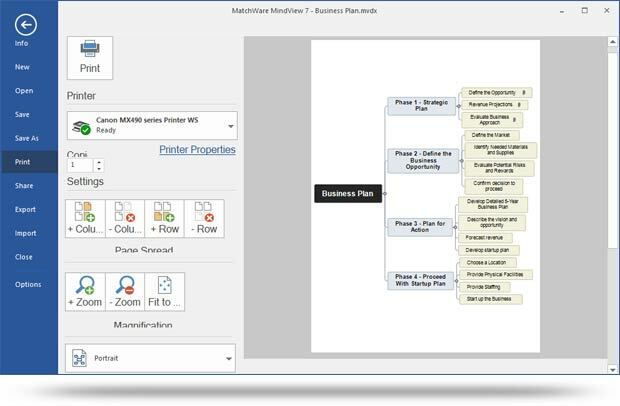 Start by brainstorming your tasks, then allocate resources and establish priorities using the intuitive Mind Map interface. 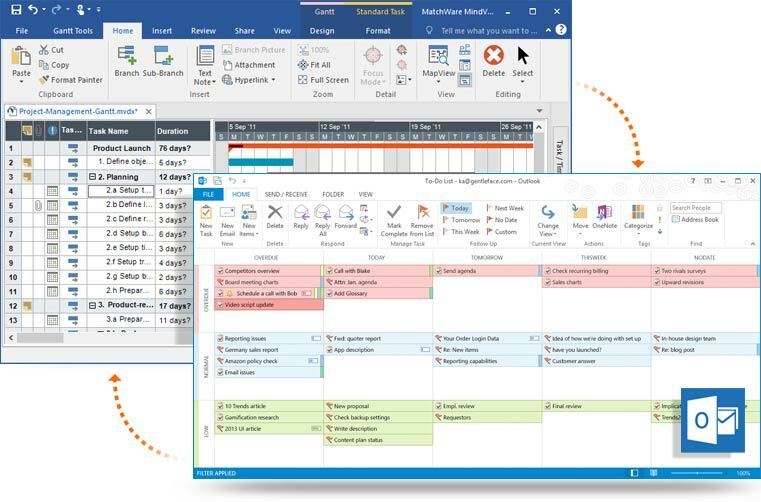 At that stage, switch to the Gantt view to fine-tune your project planning using the popular Gantt chart interface and take advantage of all of the standard project management features. Of course, you can also build complete projects from scratch in the Gantt view. 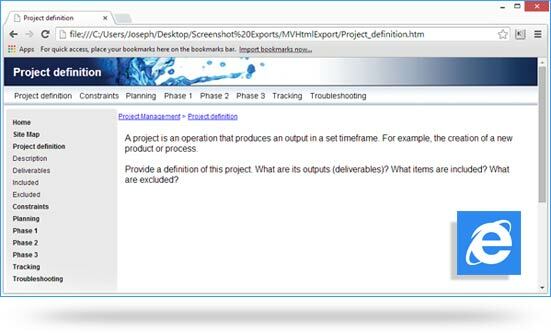 MindView lets you easily export your MindView project schedules to Microsoft® Project. Conversely, you can import project plans developed in Microsoft® Project into MindView to make full use of MindView's innovative brainstorming features. 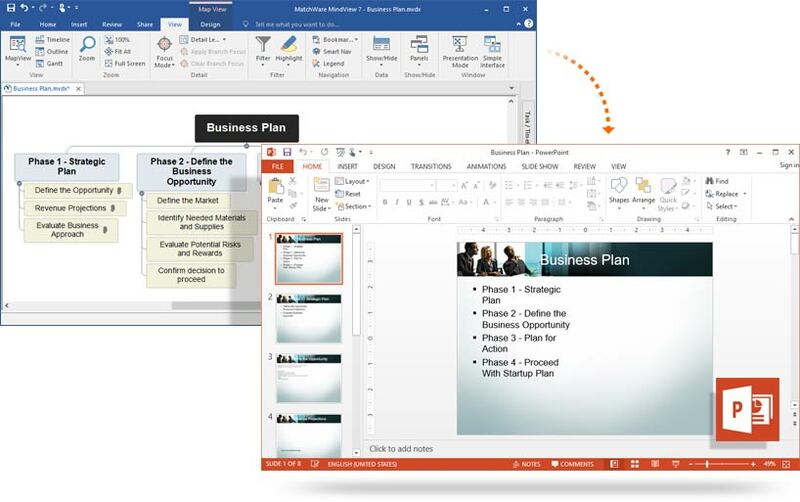 MindView is fully integrated with Microsoft Office. 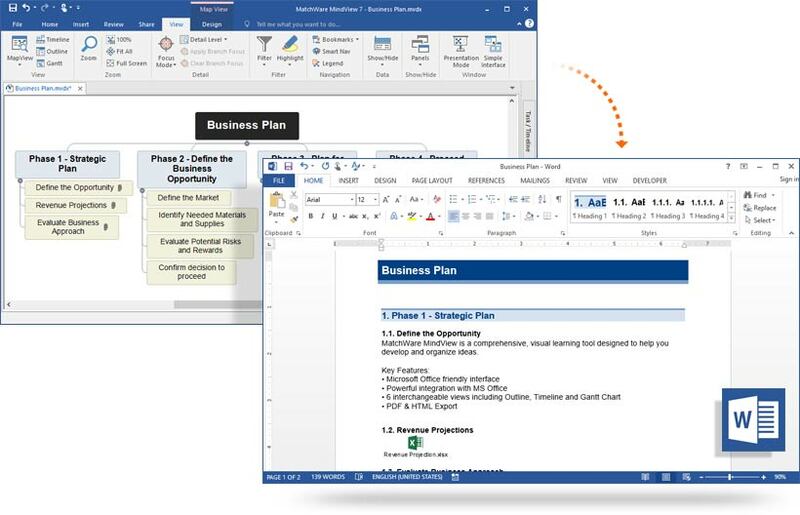 A simple click of your mouse allows you to generate clearly outlined Word® documents, professional PowerPoint® presentations or detailed Outlook® task lists. Conversely, you can import documents created with these applications into MindView and take advantage of the full potential of Mind Mapping for your existing data. In addition, MindView lets you export your project plans to Microsoft Project for further development or import existing schedules from Microsoft Project into MindView. 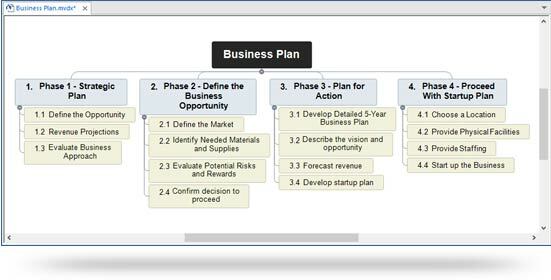 First, create a framework for your ideas in one of the Mind Mapping views. Then export to Word using our professional, ready-to-use templates to produce a fully formatted Word document, complete with table of contents, page numbers, headers and footers, and a structure that reflects the precise structure of your Mind Map (main branches become main paragraphs, sub-branches become sub-paragraphs, and so on). 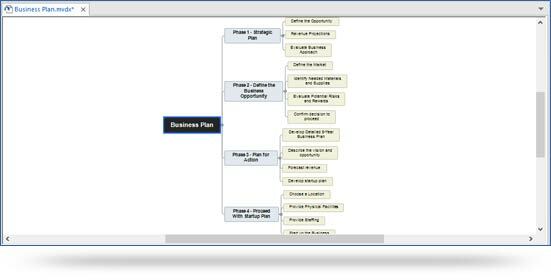 Mind Mapping is ideal for creating outlines for proposals, reports, contracts and many other types of documents. MindView also lets you re-import exported documents into MindView while retaining any additional work done in Word, as well as the branch structure and layout of the original Mind Map. You can even import original Word documents into MindView. In that case, the branch structure of the new Mind Map is based on the paragraph structure of your original Word document. Finally MindView lets you export your maps as RTF documents. Start by storyboarding your presentation in the Mind Map view and then export it to PowerPoint to create an engaging and professional-looking presentation based on one of MindView's ready-made templates. Each branch is exported as a slide, with any sub-branches listed below the slide heading. As with Word, you can re-import your presentation into MindView at any time, including slides, pictures and comments you might have added. The branch structure and layout of your original Mind Map is preserved. 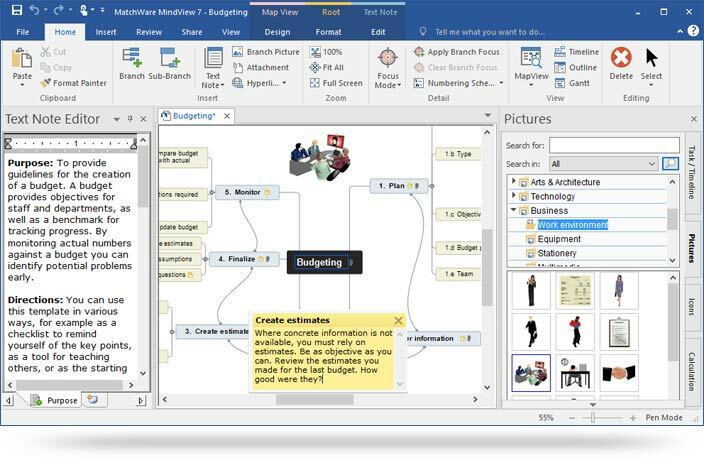 You can also import native PowerPoint presentations into MindView to review their structure using MindView's brainstorming and Mind Mapping capabilities. 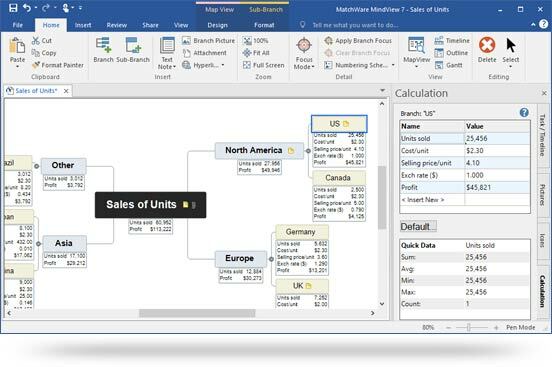 With MindView you can export your Mind Map as a Microsoft® Excel spreadsheet. 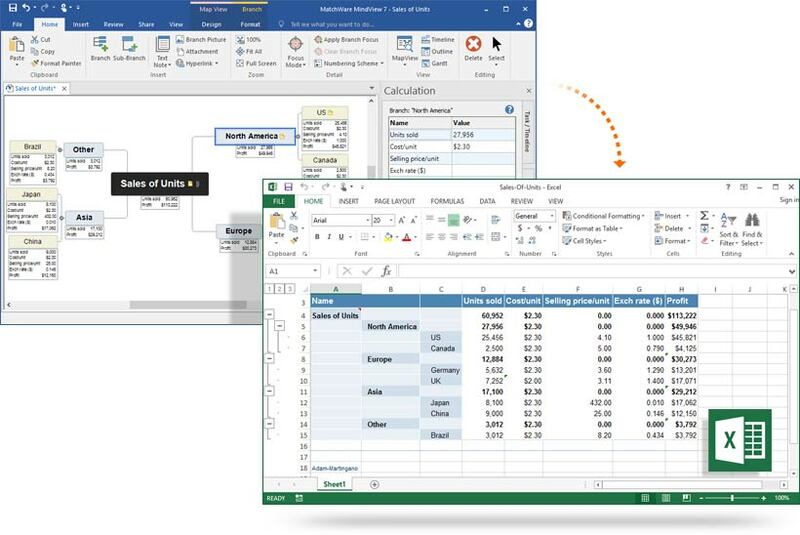 You can for instance create a Mind Map to brainstorm a budget forecast, consolidate it by using the Calculation panel to enter the actual sales figures, and then export the map as an Excel spreadsheet to perform a more detailed analysis of your figures in Excel. When exporting, you can choose from several professionally designed templates to enhance the look of the spreadsheet. You can also determine how the branch layout should be represented in the spreadsheet, by choosing to export the map either as a structured list reflecting the branch hierarchy, or as a numbered list where each sequence number identifies the position of the branch in the overall map. Not only are all the calculation values exported, but if you use the Advanced Export option, you can also export any or all of the standard task data fields, namely Start, End, Duration, Completion, Priority and Resources. After working in Excel you can re-import the spreadsheet back into MindView to obtain an updated Mind Map containing all the data changes you made in Excel. As mentioned above, MindView lets you export your task lists to the task folder of your choice in Microsoft Outlook. You can also import task lists from Microsoft Outlook and use MindView to synchronize the versions of the task list stored in Outlook and in MindView. 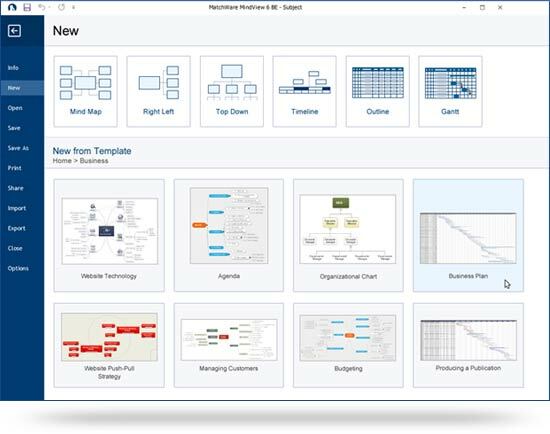 MindView lets you create, refine and manage project plans from start to finish in its dedicated, dynamic Gantt view. You can also export your project plans to Microsoft Project for further expansion, if necessary, either directly in Microsoft Project's .mpp format or via Microsoft Project's XML format. Conversely, you can import existing Microsoft Project plans into the Gantt view directly from Microsoft Project or via Microsoft Project's XML format. This is particularly useful if you want to review the structure of your plans using the Mind Mapping technique or view your plans as timelines. Create professional quality websites based on your Mind Map with a single click - No HTML experience required! MindView comes with a host of professional HTML export templates offering different navigation options, such as tree view, level list or easily customizable standard links and buttons. Instead of the default positioning, you can use the Export Wizard to define where your objects should be placed on the HTML page. MindView allows you to import XML files of various formats, including Microsoft Project XML, MindManager XML and Excel XML. These options are particularly useful if you do not have the related software application installed on your computer. You can also export your MindView documents as MindView XML files, Microsoft Project XML or Excel XML files. The Pack & Email feature lets you distribute your maps to others, including all multimedia content and external linked files. You can copy the entire map to a specific folder, compress it as a zip file or compress it as a single MindView file. The FREE MatchWare MindView Viewer enables you to share your MindView documents with colleagues or clients who are not MindView users. After installing the viewer, anyone can view your Mind Maps in any of the MindView views, including the Timeline view and the Gantt view, filter them and print them. If you have attached graphics and external files to your Mind Map, just save it using the "Pack & Go" feature to enable the Viewer to display all these elements. The free viewer can be downloaded at any time from here or from the Downloads menu at the top.